The Little Giant Beehive Entrance Feeder is an easy-to-use plastic feeder that will fit directly into the front entrance of your hive. Designed to fit into the large opening of the entrance reducer on our Little Giant 10-Frame Complete hive, the feeder allows space for the bees to come and go while nourishing them with a simple syrup when natural food sources are scarce. 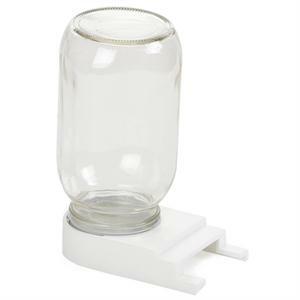 The base is made of high-impact plastic, and the clear glass jar allows you to see the feed levels without disturbing the bees. Holds approximately 1 quart.